By Dennis W. Viau; adapted from several recipes. Meatloaf is boring. You’d only serve it to your family because they are supposed to be forgiving and patient. 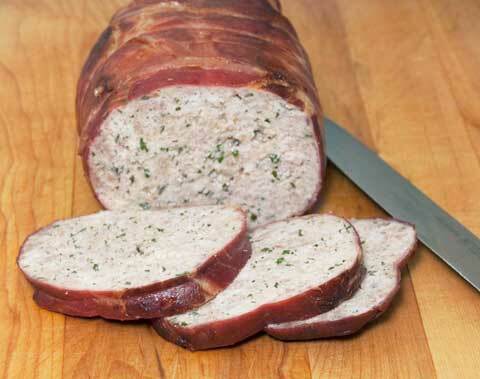 With this recipe you can feel proud to make this meatloaf for even the most special of occasions. It looks beautiful and it has a delicious flavor. I gave this recipe to a friend who loves meatloaf. His wife made it for him and he called me to say it was the best meatloaf he had ever tasted. Mix together the ground meat, ricotta, egg, egg yolks, Parmesan, nutmeg, salt, pepper, garlic powder, onion powder, and parsley. Shape mixture into a loaf. If the mixture is too moist to hold a shape, add bread crumbs, about ½ cup, until the mixture firms enough to hold a loaf shape. Lay out pieces of string—one long piece to tie the loaf around its length and three shorter ones for tying the sides. Arrange the slices of prosciutto on the strings, overlapping the edges, and place the loaf on the prosciutto. Wrap the loaf in the prosciutto slices, completely covering the loaf. Tie gently with string. Heat the butter and oil in a heavy skillet, and brown the loaf all over, about 3 minutes per side, including the ends, over medium-low heat, turning it carefully with the aid of 2 spatulas or flat tongs. Transfer to a small baking pan and add the wine. Bake at 350°F (175°C) for 45 minutes to 1 hour (internal temperature of 150°F (65°C)), until the loaf is firm to the touch, adding more wine at 15-minute intervals to keep the pan from baking dry. Transfer the meat to a platter and let rest for 10 to 15 minutes. Skim off the fat from the pan juices and strain. Remove the string from the loaf and slice. Pour the hot juices over slices and garnish with parsley. If you believe this recipe is worth having, please consider making a donation toward this web site’s maintenance. Thank you.